Dragon Quest Builders 2 Pre-Orders Available! I Believe This Confirms DQB2 to N/A? 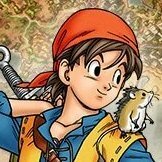 Gamatsu announced Western DQB2 release. Dragon Quest Builders 2 Western Release leaked?